Some two years ago I acquired a ‘Monotype’ Composition Caster – a machine that automatically casts individual printing types from molten metal and sets this type into justified lines, ready for printing. By automatically, I mean that the operation of the machine is controlled by a punched paper tape whose perforations are created by an entirely separate keyboard. For the printer, typographer or general enthusiast of machinery, a running ‘Monotype’ Caster is an amazing thing to witness. I have had a great interest—okay, obsession—with these machines for several years. This passion culminated in my attending Monotype University 5, where I first met the amazing Mr Paul Duensing, from whom I acquired my first machine. Unfortunately, this caster was damaged in shipment! It took two years for me to fully recover from this minor tragedy and to locate a similar machine. 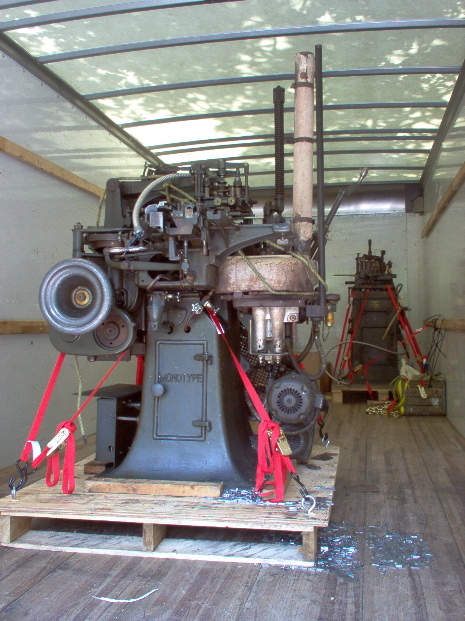 Finally this spring, a similar, though slightly more worn out composition caster emerged at Heritage Printers, in Charlotte, North Carolina, under the care of Pat Taylor. As it happens, Pat Taylor was my tutor on the Monotype Composition Caster at Monotype University, so it seems fitting that I should acquire this ‘new’ machine from him. 3-phase power to the 3/4 hp motor – this will probably be provided by a variable frequency drive, which should allow finer adjustment at low speed settings. Propane gas to power the melting pot – the pot was previously feed by natural gas, which means that the burner orifices must be reduced, probably by soldering and re-drilling an even smaller hole. Water coolant – my shop has no nearby water supply, so the casting machine moulds must be cooled by a recirculating water system. I plan to start building a unit based on the model designed by Jim Walczak, and presented at the 2004 ATF Conference. Air power to control the machine at a steady 15 psi – this one is easy: I already have a very serviceable compressor. I intend to document the progress here, along with photos of the ‘Monotype’ Caster and the entire shop. I often wonder about the possibility of combining my varied interests to create something more meaningful, more lasting, than any one avocation ever has the chance to produce. 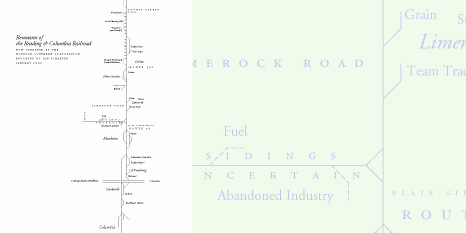 Last night while looking at my partial schematic of the former Reading & Columbia Railroad that runs through Lititz I thought the text labels on the diagram might be more understandable if I rotated them 90 degrees. This felt like the first time I thought about the railroad as a designer, not simply a rail fan. Within a short time I transformed my barely serviceable sketch into an a more lucid and artful interpretation of the subject at hand. I don’t expect that a “map” like this could matter much to anyone else, but I feel compelled to pursue the idea a bit further, and to eventually take it into the letterpress shop. It is a small pedestal machine. Friedrich Deckel. Type G.I. Machine No. 2751. A close-up of the pantograph arms with engraved graduated scale. The spindle is easily removed from the machine. …and the bottom half of the spindle assembly. Spindle arbor and pulley should separate but are too tight to remove by hand. Digital illustration, printed letterpress from metal plate, private commission. Click for detail. Wood engraving, hand set metal type, copper photo-engraving for 2nd color, printed letterpress. Click for enlargement (~200kb). Handset wood and metal type, printed letterpress, private commission. Linoleum cut with handset metal type, private edition & Amalgamated Printers’ Association bundle submission. Hand set metal type, Amalgamated Printers’ Association bundle submission. Here’s a small linoleum cut that I just finished. This peony will illustrate a collaborative letterpress piece I am doing with J C Groff. In the final piece the peony will print white on a medium toned paper. The body, typeset by Jim, is excerpted from a letter he sent to me. One hundred fifty finished prints will be submitted to the APA. I’ll try to remember to post the finished piece. And yes, I did notice that it has been exactly six months since I last posted to the site. Ouch. Ian Schaefer, Designer & Letterpress Printer. Yet does any of this fairly cover my efforts in web design? Brand identity? Posted some photos of the old Deckel pantographic engraver that I recently brought into my shop. It needs some work, but will eventually, hopefully, be used to cut matrices or punches for the creation of new designs in metal printing type. The scene is always changing in this shop. This is how it looked in February, 2005—a little cramped. 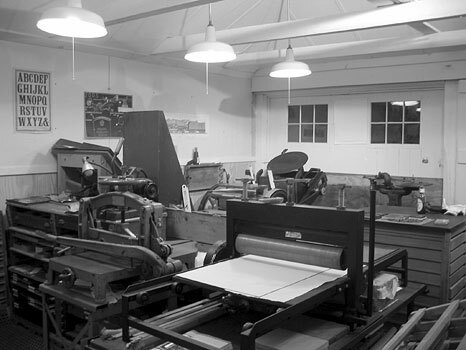 On the right, in the background, is the recently acquired, pre-war Deckel pantographic engraver , which I am hoping to bring back to life. Someday it will be used to engrave brass matrices—or punches which in turn will be driven to form matrices—for casting new metal printing types of my own design. Casting type will eventually be accomplished with Monotype equipment like the composition machine that arrived here last spring. A view of the shop, February, 2005. Works in progress, a.k.a. 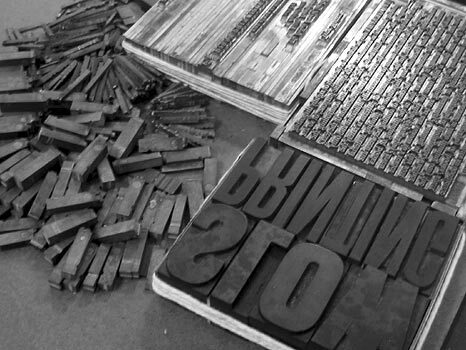 piles of type.